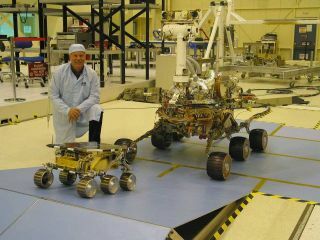 Two generations of Mars rovers: Sojourner rover (left) and the larger Mars Exploration Rover (right). When the Curiosity rover touches down on the surface of Mars in August 2012, it will be the fourth rover to make tracks across the Red Planet in fifteen years. Curiosity, or the Mars Science Laboratory, is slated to launch into space on Saturday (Nov. 26) from the Cape Canaveral Air Force Station in Florida. It will then begin an 8 1/2-month journey to Mars, before it sets down in the huge Gale crater. There, it will dig, drill and analyze rocks, searching for signs that the planet is or was habitable. When Sojourner landed on July 4, 1997, it became the first robotic rover to explore another planet. Part of the Mars Pathfinder mission, which was itself part of NASA's Discovery program, Sojourner was intended to be a fast and inexpensive project to explore the Martian surface. At just over 2 feet (65 centimeters) long, 1.5 feet (48 cm) wide, and less than a foot (30 cm) tall, Sojourner wasn't large in stature. The rover's six wheels slowly inched across the surface, and it took its power from the sun. Sojourner's analyses of the surface rocks of the Red Planet paved the way for future Mars exploration. Sojourner returned information for almost three months, well beyond its planned operational lifetime of seven days. "Sojourner did amazing things," Brian Cooper, of NASA's Jet Propulsion Laboratory in Pasadena, Calif., told SPACE.com. When he piloted Sojourner, Cooper became the first person to drive a robotic vehicle on the surface of another planet. Cooper has helped design software for all four Mars rovers, piloted the twin Mars Exploration Rovers, and is slated to steer Curiosity when it reaches the Red Planet. When the Mars Exploration program decided to send the next robot to Mars, two rovers were launched instead of one. Landing on opposite sides of the planet in January 2004, Spirit and Opportunity carried identical tools into different regions. While better technology usually means components get smaller, Spirit and Opportunity were both larger than Sojourner. At 5.2 feet (1.6 meters) long, 7.5 feet (2.3 m) wide, and 5 feet (1.5 m) high, they literally towered over their predecessor. Like Sojourner, the rovers were equipped with six wheels for maximum stability across the uneven surface of Mars. They, too, have multiple cameras — a panoramic camera for wide images, and a navigational camera to help them steer. A robotic arm, which can be moved to analyze specific samples, contains several instruments. A microscopic imager provides high-resolution images of the soil and rocks on the surface. A rock abrasion tool allows the robot pair to scrape surface dirt from rocks, and various spectrometers allow scientists at home to analyze what the rocks are made of. Usually as technology progresses, things get more compact. Not so with the Mars rovers, which have grown larger. The wheels, from left to right, come from Sojourner, one of the twin Mars Exploration Rovers, and Curiosity. Spirit and Opportunity were equipped with solar panels for power. Scientists expected dust dropped from storms to cover the panels and reduce the available amount of power. But, the winds of Mars helped remove the dust, which lengthened the missions of both rovers. After three years on the Red Planet, one of Spirit's wheels stopped working. Spirit continued to hobble along on five wheels, but in June 2009, the rover became stuck in a patch of fine material, and a second wheel gave out. Spirit continued to explore the area around it until it stopped sending signals in March 2010. Mission controllers hoped the rover would come out of hibernation after the harsh Martian winter, but all subsequent efforts to revive Spirit failed. In six and a half years, Spirit explored about 5 miles (7.73 km) of Mars' surface. On the other side of the planet, Opportunity continues to trundle on, almost eight years after touching down. Along with data about the surface, Opportunity discovered the first meteorite found on another planet. Currently, the rover has traveled more than 20 miles (34 km), and is still going strong. When Curiosity lands, it will be the largest rover yet to visit Mars. At 10 feet (3 m) long — plus its 6.2 foot (1.9 m) robotic arm — 9 feet (2.7 m) wide, and 7 feet (2.2 m) high, Curiosity makes the twin Spirit and Opportunity vehicles look tiny. The next time the Curiosity Mars Science Laboratory be in this same configuration — wheels deployed and remote sensing mast and instrument-tipped arm extended — will be after it is deposited on the surface of Mars in August 2012. Similar to the previous rovers, Curiosity boasts six wheels for increased mobility. But due to its unique landing method, the mobility system itself will also function as a landing system, absorbing some of the shock when the rover touches down. Curiosity's robotic arm carries an imager, spectrometer, drill that can pick up rock samples for analysis, brush to remove dust from rocks or equipment, and an observation tray. "We've increased the amount of science happening on Curiosity," Cooper said. Unlike the previous rovers, which relied on solar power, Curiosity carries a generator powered by a nuclear battery with a lifetime of 14 years. Previous NASA missions, such as the Apollo moon missions, the Viking Mars lander, the twin Voyager space probes, the Cassini spacecraft around Saturn, and the New Horizons probe currently on its way to Pluto, have used a similar power supply. "Curiosity combines a little bit of old with a bunch of new."